Lowering remakes can save most dentists over $100,000 per year. In my 20 years of teaching, I have found the most effective method of training is to work with dentists in their own offices. This approach allows the dentist to remain comfortable with their usual surroundings and team members, and allows them to learn while working on full-fee patients. Traveling to an institute can cost tens of thousands of dollars. My approach saves money… and they learn more in a shorter period of time. The unique challenges of the group practice relate to managing a staff of 30+ dentists. Typically there will be five “top” dentists in the group that are high producers with low remakes who are the key dentists. There are also the “bottom” five dentists who tend to be low net producers with either low production and/or high remakes. These dentists probably won’t be in the group a year from now. Most important are the 20 middle, or average dentists. 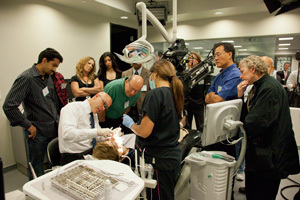 The key to success for the group is to train these dentists to work more efficiently with higher clinical confidence. When these middle 20 dentists produce more with lower remakes, the profitability of the group skyrockets. Since groups tend to employ younger dentists with low clinical confidence, coaching helps them diagnose more dentistry when they feel they can successfully complete these cases. The more these dentists can produce within the group, the less dentist turnover the group experiences. Over the past 10 years, I have asked hundreds of solo practitioners what their remake rate is and none of them have been able to give me an exact number. It’s not something dentists typically track, but it’s an important number that gives insight into clinical success and profitability. For example, reducing a dentists remake rate from 16% to 6% results in a $60,000 net savings for the dentist. As two-thirds of the average American dentists production comes from crown and bridge, these issues are too big to be ignored. Since 86% of crown and bridge cases are one unit (75%) or two unit (11%) cases, it becomes critically important to master these types of bread and butter cases to ensure your practice minimizes remakes to keep your profitability high. Daily and hourly coaching is available. See Dr. DiTolla in action! Learn more about Dr. DiTolla's courses.